Goovigen is a small rural village in the region’s northern farming heartland. A short distance north-west of Jambin off the Burnett Highway, fewer than 300 people live in the town. The streets of Goovigen are as neat as a pin and the heritage buildings have been either restored to their former glory or updated for present needs. The corrugated iron Percy Schluter Historical School of Arts Hall is about as quaint as you can get and houses the local history and stories of its pioneers. Built in 1929, the building was under threat in 2010, until a group of dedicated history lovers took up the challenge to save the site, turning it into the heritage heart of the town and a significant attraction for visitors. Among interesting displays on the life and times of the pioneer families, you’ll find a fabulous collection of old glass bottles. The site also includes Engel Homestead. Rich with fields of cotton, cattle and grain, the surrounding area is typically serene. Life beats to the seasonal patterns that bring the sunshine and rain. In fact, most of the talk around here is about the weather, what it’s doing and what to expect. Well, the weather and fishing. Fishing is a big pastime in these parts, with many local creeks about the place, most notably Callide Creek, Lake Victoria and Lake Pleasant a few kilometres further north. 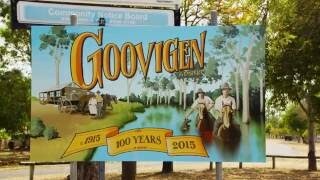 If you’re looking for information or a good bite to eat, the friendly locals at Goovigen Hotel Motel, on the Goovigen-Jambin Road offer both…and a tip, Wednesday night is Special Price Night.